Isaiah lived in Jerusalem in the 8th century BC. He wrote the Book of Isaiah, possibly in two parts with a 15yr interval between them. He was married to a “Prophetess” (Isaiah 8:3) and had two sons, Shear-jashub and Maher-Shalal-Hash-Baz. 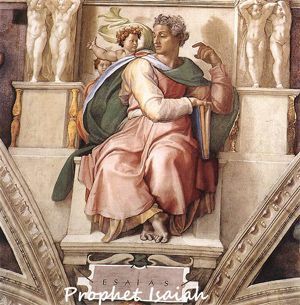 The writings of Isaiah are filled with his prophecies, many of which related to the coming of the Messiah, Jesus Christ, but one has yet to be fulfilled! St Jerome commented that Isaiah wrote more like he was composing a history of the past than prophesying! His prophesying was very accurate! Lord Jesus, grant me the strength to obey your ways, dispel my selfishness and open my heart. Amen. in life and at the hour of my death. the spirit of prayer and fervour in the service of God. into the hands of Jesus and Mary. Amen. On this day in 418, St Boniface was elected Pope. Pray for the successful intentions of our present Church Leaders. May they bring peace and unity to all Christian faiths.